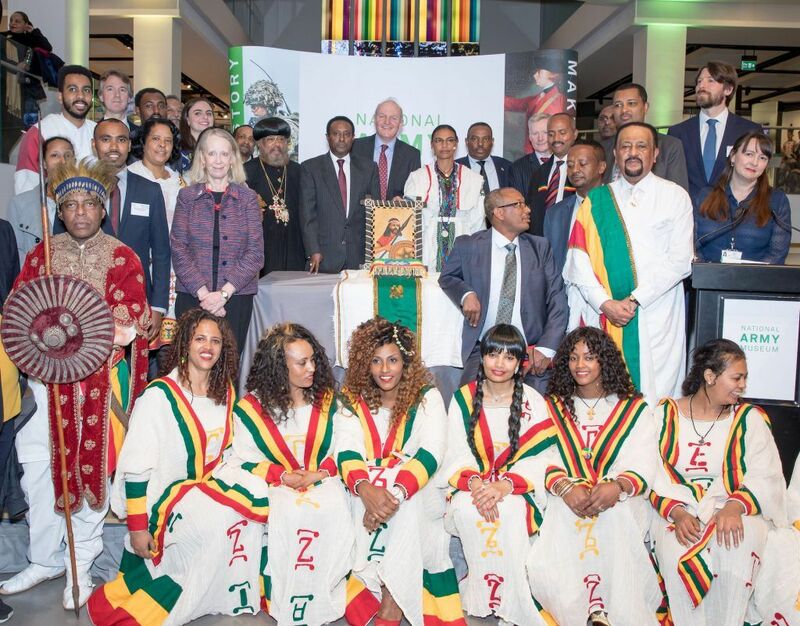 At a ceremonial hand-over that took place on Wednesday 20th March at the United Kingdom’s National Army Museum in Chelsea, London, Ethiopians, friends of Ethiopia and the media witnessed the long-awaited return of hair taken from one of Ethiopia’s most popular Emperors, Tewodros II. This historic moment follows discussions between the Ethiopian Ambassador, H.E. Mr. Fesseha Shawel Gebre, and the Director of the National Army Museum, Brigadier Justin Maciejewski DSO MBE. On behalf of the People and Government of Ethiopia, Her Excellency Dr. Hirut Kassaw, the Minister of Culture, Tourism and Sport, received the human remains in a box covered with the Ethiopian flag from the Museum’s Director, with the crowd ululating in jubilation. Speaking on the occasion, H.E. 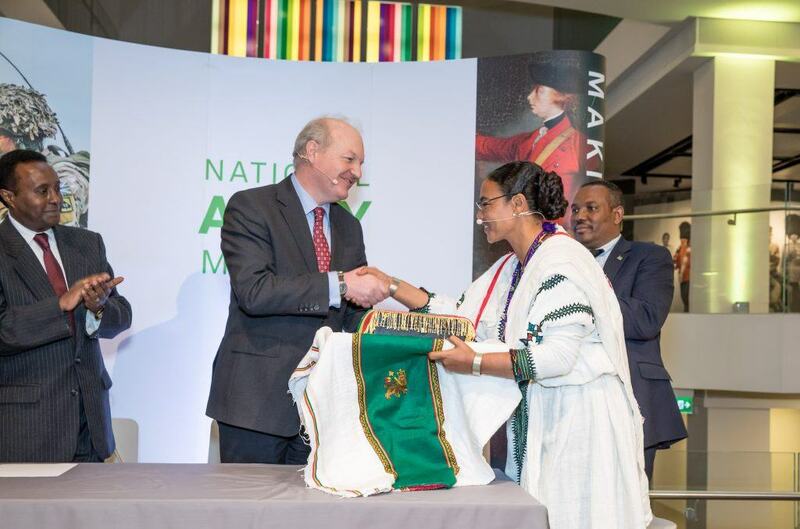 Dr Hirut applauded the National Army Museum, and its Board of Trustees, for the brave and principled decision to return the Emperor’s hair to its rightful home, adding that she hoped that the United Kingdom and Ethiopia will be able to build on this supreme gesture of goodwill in the years to come. Finally, the Minister called on all museums and collectors who retain Maqdala heritage in their collections to return all Maqdala artefacts to their rightful home. “Whatever the future holds, I have no doubt that the relationship between our two countries will continue to go from strength to strength. A fact underlined by the substance and spirit of today’s ceremony,” she concluded. On Thursday 21st March, H.E. Dr. Hirut Kassaw and her delegation visited St George’s Chapel at Windsor Castle – the resting place of the remains of Prince Alemayehu, son of Emperor Tewodros II. On behalf of the People and Government of Ethiopia, the Minister laid a wreath of remembrance on the young Prince’s grave before observing a minute’s silence and prayers. Welcoming the Minister and her delegation, The Reverend Dr. Mark Powell, Canon of Windsor, led the delegation through a tour of the chapel where they were shown a brass plaque remembering Prince Alemayehu, as well as the Coat of Arms of Emperor Haile Selassie I commemorating his membership of the British Order of the Garter. 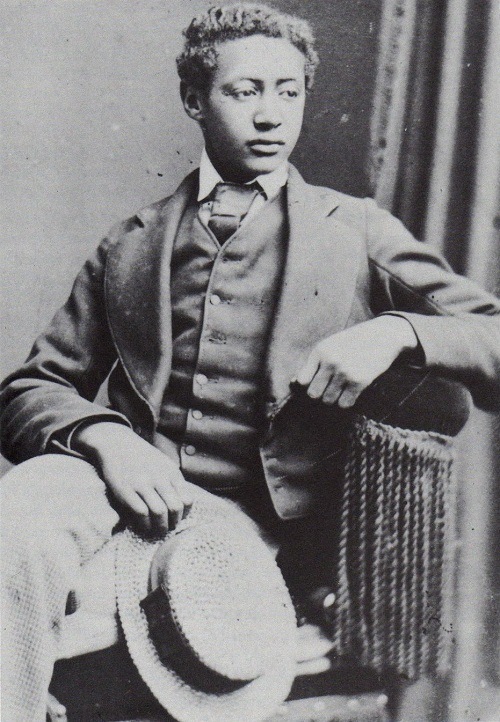 In discussions that followed with the Canon of Windsor, the Minister requested the remains of Prince Alemayehu be repatriated to his homeland in Ethiopia so that he could be reunited with his father’s remains and with the people of Ethiopia. The Minister asked for her request to be passed on to all concerned bodies so that it could be addressed as soon as possible. The Minister’s full speech can be found on our website at http://bit.ly/NAM_HKSpeech. Born in Gondar, Northern Ethiopia, Tewodros II was Emperor of Ethiopia from 1855 until his death in 1868. The locks of hair were taken from Emperor Tewodros after he heroically committed suicide rather than be taken prisoner by the invading British army in April 1868 during the battle of Maqdala. The Emperor is held in high esteem by Ethiopians who recognise him as the founding father of modern Ethiopia, as he began the transformation of the state. The Emperor is buried at the Mehabere Selassie Monastery in his native Quara, in Northern Ethiopia. After the Battle of Maqdala, Emperor Tewodros’ son, Prince Alemayehu, was taken to Britain, under the care of Captain Tristram Speedy. He died from pleurisy at the tender age of 18, in Leeds, and is buried within the precinct of St George’s Chapel at Windsor Castle. In 2007, the Government of Ethiopia submitted a request to Her Majesty The Queen for the return of Alemayehu’s remains for reburial in Ethiopia.